Since the election in October last year, the fascist Freedom Party has joined a coalition government in Austria. Why has its support grown? The dynamic is this: Both the Conservative Party of now chancellor Sebastian Kurz and the Freedom Party of vice-chancellor Heinz-Christian Strache campaigned on an anti-establishment basis. They were able to present themselves as forces for change. 97 per cent of Freedom Party voters and 75 per cent of Conservative voters rejected the former coalition government of Tories and Labor. This comes after years of stagnating wages, austerity, disappointed hopes in the European Union since Austria joined it in 1995 and so on. Here a second important factor comes into play. Kurz and Strache are tapping this anti-establishment sentiment with racism, blaming Muslims and refugees for this situation. The previous government, including Labor, sowed the seeds for this by attacking Muslims with a special “Islam law”, talk that we cannot bear any more refugees, etc. How has the new government pursued its racist and anti-Muslim agenda? Not one week goes by without the government announcing an attack. Just a month after taking office the minister of interior, Herbert Kickl of the Freedom Party, announced that he would again seek to “concentrate” refugees in one place. And he delivered. The number of negative applications for asylum has risen significantly and deportations have accelerated, especially to Afghanistan. They want to ban the headscarf in Kindergartens, schools and universities, announced the closure of seven mosques, and deportation of 40 Imams to Turkey. And on the top of it, the government set up a new anti-refugee police force, a 600-strong special border guard, and held an exercise to practice for preventing an influx of refugees from coming to Austria at the border with Slovenia. They are seeking allies in Europe for their racist agenda, building an axis from Berlin over Vienna to Rome – inspired by the fascist Berlin-Rome axis in the 1930s. What resistance has there been to the government’s attacks on refugees and Muslims? We have been building the “Platform for a Humane Asylum Policy” since the great “refugee crisis” in 2015, when on 3 October 2015 over 70,000 marched for welcoming refugees and open borders. It includes ourselves, revolutionary socialist organisation “Left Turn” (Linkswende), refugee aid organisations, refugee run-associations, youth organisations of the Labor party, the Green Party in Vienna and the Volkshilfe, an NGO close to Labor. This platform is at the forefront of the resistance to the government’s racism. Together with the students union, trade unionists and anti-fascist organisations we mobilised 10,000 people on the government’s inauguration day in December 2017 and then 70,000 people on 13 January under the slogan “against racism and social cuts”. Then again 8000 marched on the UN day against racism on 17 March and 5000 on World Refugee Day in June. What role have Linkswende jetzt played in the anti-racist campaign? We have been trying to build the broadest possible coalition in the “Platform for a Humane Asylum” policy by bringing Social Democrats, Greens, trade unionists, refugees, Muslims, and other anti-racist forces together – on a broad basis of “Welcoming refugees”. Our goal is to give the broader solidarity movement with refugees a political voice. On our initiative the platform made important political steps forward when in 2016 we confronted and stopped two Pegida-style racist marches of the Freedom Party in Vienna. They tried to build up a fascist street movement, which we nipped in the bud. One of our most important interventions recently was defending Muslims within the platform from attacks not just by the media and the right-wing government, but from within the platform. We succeeded. Now the self-conception of the platform is explicitly fighting “anti-Muslim racism, anti-semitism and all forms of discrimination”. The government is saying it wants to closure “the mosque route”, another term they use for the “Balkan route” that refugees take from Greece over the Balkans to Austria and Germany by “hopping” from mosque to mosque. Anti-racism today means defending refugees and Muslims, it is inseparably linked. The government has also launched a major attack on workers through allowing more “flexible” working hours. What will this mean and what is the unions’ response? This means not just reductions of wages through loss of overtime payments but dramatic changes in people’s working lives: incompatibility of family and job, more job insecurity etc. At the same time the government is cutting funds for Kindergartens so it will especially hit women and single mothers. 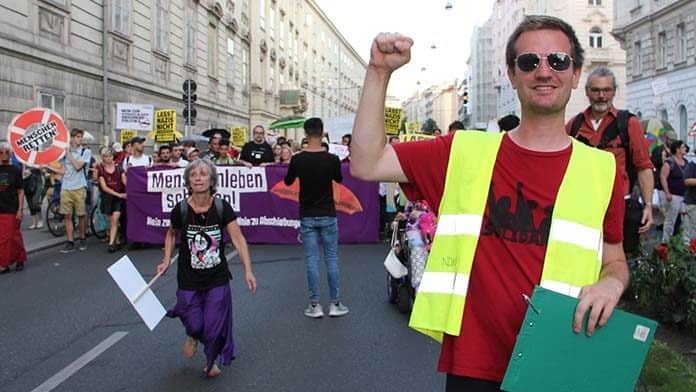 The Austrian Trade Union Federation (ÖGB) called for a massive protest against the government’s plans on 30 June, with a fantastic turnout: over 120,000 people took to the streets in the capital Vienna. In the two weeks before and after 1400 workplace assemblies took place all over Austria. The initiative for the trade unions to mobilise came from above. The trade union leaders are afraid of losing their ability to negotiate, so they had to mobilise their base, especially the shop stewards in the companies. Is the government using its racism to try to force these attacks through? Yes, the reaction of FPÖ leader Strache is characteristic. On the very same day of the demo he posted on Facebook that all Turks, who voted for Recep Tayyip Erdoğan should immediately leave Austria. Every time the government announces another attack, they also put a racist attack forward. Another example: When they made their plans public for a massive reform of social insurance, they called a press conference about the deportations of Imams and closure of seven mosques. It is crucial to reject this racism unambiguously and intervene politically in the movement against the 12-hour working day. Our platform built a Refugees Welcome-block on the massive trade union demo with the slogan, “Yes to culture of welcoming refugees! No to 12-hour working day”. Unless we confront the racist offensive of the government we won’t be able to fight back effectively the austerity that comes along with racism. We want Muslims and refugees in, and the Nazis out.